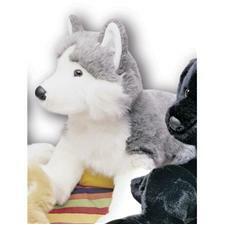 A soft lifelike stuffed plush Husky created in the Bocchetta family tradition. A beautiful lifelike stuffed plush Husky created in the Bocchetta family tradition. A floppy plush husky from the Fiesta Good Dogs collection. Looking into the eyes of this lifelike husky will melt the heart of any dog lover! With top-quality construction and great attention to detail - right down to its curled tail - this is a dog that will be a faithful companion for many years. Built sturdy. Not intended as a seat or ride-on. Find Plush Siberian Huskys for bid at Ebay.